Kaila Rachel Rea of Turnersville said yes to Dominick Santiago of Millville last Spring. 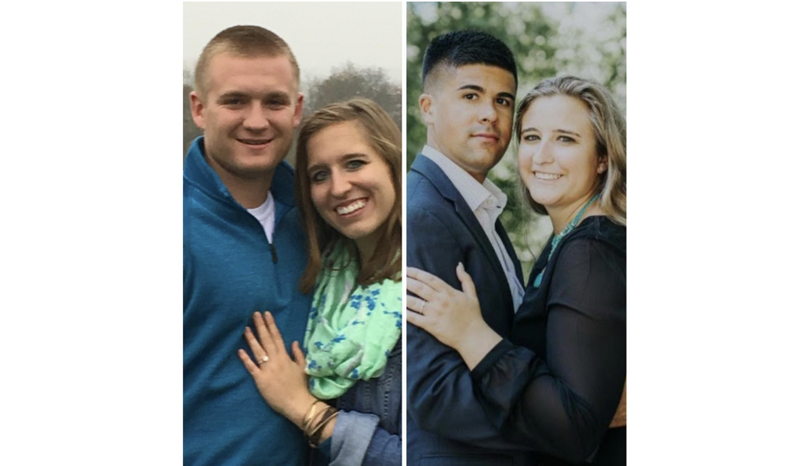 They met when Santiago hired Kaila at Kay Jewelers and began their story during a team-building event at Bonefish Grill. Little did Kaila know that none of the other employees were attending, as they were all in on the romance of getting this young couple together. Yes, every kiss begins with Kay. Kaila is now a first year graduate student at Stockton University for speech/communications Disorders. Dom recently graduated from the police academy and is enjoying his career choice as a Millville police officer. A May 2018 wedding is in their future. Just a few months later, Kaila’s sister, Alyssa Nicole Rea also of Washington Township, was recently engaged to Nate Williams of Kralltown, Pa. The couple met while attending Elizabethtown College for undergraduate studies. Alyssa is now a certified occupational therapist for Genesis Skilled Nursing Facility. Williams is currently a student at Penn State Hershey Medical. A September 2018 wedding is planned. Yes, three months apart. Alyssa and Kaila’s parents, as well as their brother, Tyler, are excited to welcome these young men into our family.